Sir Philip Green is selling the struggling department store, but who's going to buy it? Another nail has been struck into the old British high street’s coffin. Ten years after Littlewoods departed and six years after Woolworths followed it into the department store grave, BHS is facing sale and possible dismemberment. This follows years of speculation that Green wanted out of BHS, which has struggled in recent years with tumbling sales. Its revenues declined 3.5% in 2013 to £675.7m, according to its latest filings at Companies House. Although cost-cutting measures meant its bottom line was healthier than in the previous year, BHS still suffered a pre-tax loss of £69.6m. Parting with the department store must be not-so-sweet sorrow for Green, who made his first billion on the back of his £200m purchase of BHS (British Home Stores) from Storehouse in 2000. It was his first major foray into the high street, and selling it would be his first big retreat after years of acquisition. So who might be behind the ‘several’ approaches Green has received? And what might they do with BHS? Don’t say you’ve never heard of him. Wiese is one of South Africa’s richest men, with a $5.4bn (£3.6bn) fortune, according to Forbes magazine. The 73-year-old’s main business interest is Pepkor, a discount clothing and footwear company in his home country. 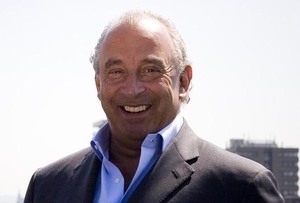 In 2013, Wiese teamed up with former Asda boss Andy Bond to plan an assault on the British high street. They looked at BHS then, but nothing came of it. It’s very possible another attempt is in the works. On Thursday, the pair announced that their new ‘challenger brand family fashion chain’, christened Pep & Co, would open fifty stores across the UK by summer. ‘Detailed planning to launch Pep & Co at scale is already in full swing’, the statement said. ‘Ranges are being selected...and the first tranche of store locations secured’. A coincidence? MT doesn’t believe in them. Apollo is the Greek god of light, music, poetry and truth. It’s also the American private equity group that set up Alteri Investors in October, with Gavin George, formerly of turnaround firm GA Europe. Alteri’s focus is on reviving struggling British and German retail chains, and although BHS will almost certainly go for more than Alteri's £50m budget (meaning Alteri wouldn't buy it on its own), it otherwise fits the bill nicely. Hilco is not a deity, but its rescue of music and movie retailer HMV has nonetheless been hailed as miraculous. HMV seemed out for the count before the ‘distressed investment and restructuring services’ group took it on in 2013. It recently beat Amazon to regain its title as the leading UK entertainment retailer (of physical music anyway). Turning around BHS would be just as impressive, but how much scope is there to ‘fix’ it? BHS’s problems aren’t with its costs or management (Green will have seen to that), but in its brand and position in the changing UK marketplace. Customers in 2015 don’t want to shop in cheap to mid-market department stores. Online offerings and competition from John Lewis on one side and Primark on the other are eating away at BHS’s base, so it’s hard to see much room for revived growth. Retail is a carnivorous industry. Firms have a nasty habit of ‘eating’ their weaker rivals, buying them so they can feast on their assets. BHS’s real value for its competitors is its real estate, not its brand. Many BHS freeholds owned by Green’s Arcadia Group are in prime locations, and both John Lewis and Primark may well want to get their teeth into some. The latter’s more likely, given its recent 15% rate of expansion, but even then it’s unlikely to want to add all of BHS’s 180 stores to its 287. And it’s not clear that owner Associated British Foods has the stomach or spare cash to pay what Green will ask for it. BHS's most valuable property is surely its Oxford Street flagship.The Telegraph reported speculation that department stores Galeries Lafayette and La Rinascente might be looking outside France and Italy respectively to explore the UK market. BHS's central London site certainly has the space and footfall for a touch of continental elegance, but the wider portfolio is again surely too big for them to swallow. Aldi and Lidl have proven that wide-scale retail disruption is by no means the sole preserve of internet traders. The German stores’ low cost business model has seen them take on the Big Four supermarkets and win, increasing their combined market share from 6.6% in June 2013 to 8.6% in December 2014. Retailers need real estate to expand, and again BHS has the goods in this regard. A total of 150 of its stores are licensed to sell food, a result of Green’s recent attempts to diversify the business to include groceries (it’s worked so well for Marks and Spencer). The German low cost supermarkets would also be unlikely to want all of BHS’s huge, food-ready stores, however. Aside from the hefty bill attached, they can’t have failed to notice the trend away from big stores to small, which has so hurt the likes of Tesco. Given the Sports Direct owner’s penchant for surprising sales and investments in declining businesses, it seems appropriate to include him, albeit as a wild card. Ashley also recently sold a chunk of Sports Direct, pocketing over £100m for some purpose or another, so he’s clearly got some deal in his sights. Whoever ends up buying BHS – and it's likely to be several of them – its sale will mark another change to the British high street, and will also unburden Arcadia of its albatross. Green may not be that choked up as a result, but he will have to clear one obstacle to pass the deal. Technically, Arcadia and therefore BHS are owned by his wife Tina, to whom Green famously transferred most of his wealth to reduce his tax bill. One presumes the Monaco-based billionairess is on board.